That Louisiana is one of the most mysterious and culturally rich states in America is well known. That it houses a wealth of Napoleonic history would come as a surprise to most. More than any other landmark, the Cabildo is a symbol of Louisiana's early history. Completed in 1799, the present structure occupies a site associated with New Orleans' first official buildings. Those edifices (the Cabildo's predecessors, erected in the early 18th century), along with the cathedral of St. Louis and the Presbytere, were built to provide a place in which the essential political functions of the newborn colony could take place. And just as when New Orleans was founded, Jackson Square in the late 18th century (previously the Place d'Armes and the heart of the city) was dominated by these three buildings. 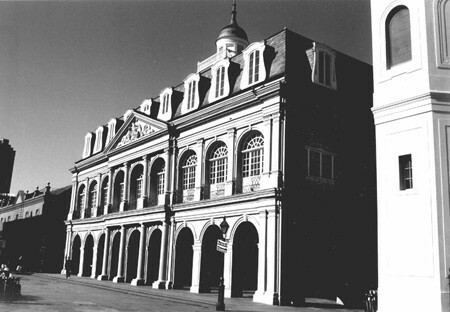 The edifice is named after the “Illustrious Cabildo” or governing body of Spanish Colonial New Orleans which used to meet there, and it entered the history books in December 1803 when ceremonies finalizing the Louisiana Purchase agreement took place in the Sala Capitular, or council chamber, in the presence of Pierre Clément de Laussat, William C.C. Claiborne, and General James Wilkinson. The Cabildo has been the Louisiana State Museum since 1911 and today houses exhibits which recount the State's history from European settlement through the American Civil War and Reconstruction. It also tells the story from the perspective of the local people, with special sections of the various ethnic groups that settled in the region. In addition to the Sala Capitular, the museum owns a number of objects of Napoleonic interest, notably: a copy of David's Bonaparte crossing the Alps; Napoleon's death mask (one of only four bronze death masks known to exist) given to the city of New Orleans by Antommarchi; a plaster bust of Napoleon c.1910; an embroidered bee believed to be from Napoleon's coronation mantle; Napoleonic commemorative medals; and a monogrammed handkerchief. Tuesday - Sunday 10:00 a.m. - 4:30 p.m.